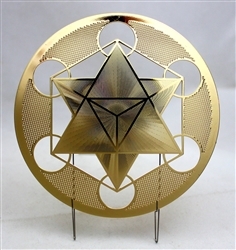 Beautiful 18 karat gold plated Metatron's Cube Yantra symbol. Size: 4 inches by 4 inches by .02 inches (same thickness as a credit card). The pattern is on both sides. Comes with a rust-proof stainless steel display stand. *In order to capture the best likeness of the item the photo has been taken at a slight angle. Metratron's Cube Yantra 18k gold plated plate, 4 inches wide by 4 inches high by .02 inches thick. The pattern is on both sides. one rust-proof stainless steel display stand included.